Ha ha that’s right, I got transferred to the Area: Monte Fresco II (Serrania), Zone: Universitaria. And so far it’s Awesome. 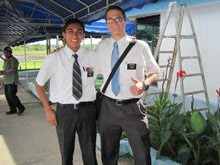 My new compañero is Elder Valenzuela. He is from Honduras! He´s a pretty cool guy and last change they baptized two families. Right now I think this is the highest baptizing zone in the Mission. I´m super excited to get to work here. We have already found a couple families and hope that they will have the faith and be prepared to be baptized by the end of next month. Yes! 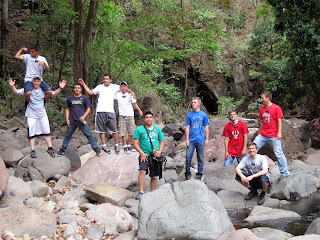 So Monte Fresco is on the Carretera Sur de Managua. I don´t think we are actually in Managua, just outside of it. So the whole area runs along one side of the main highway. Ha ha and the other area runs along the other side. There is this one barrio (neighborhood) called the Cañon. You walk off the highway and down into this really forested valley. There are recent converts and investigators that live more than 4 km farther south in the valley and Friday we went to visit them. It was the most ´tropical rainforesty´ walk I have had so far. Just on a dirt road with dense trees on both sides. Unfortunately, my camera was dead. We talked to two new investigators (now they are) the whole 4 km. It was Fun. We live in a very small room off the side of a house here in Monte Fresco. It is across the street from the big Catholic Seminary Building haha. The family that lives here is super nice. Three families actually live here. The Grandma, Grandpa, their two daughters, their husbands and one of them has twin kids about 2 years old. The other a baby girl 3 months old. The baby's name is Heysel. They are so cute. So I think they actually have a microwave. We have all our food citas (appointments) there too. Except for breakfast (which I hope will change). Same with having to wash our own clothes... We were spoiled in Boaco! Ahhh! There was no package for me at Changes!!! I tried not to believe them, I think they are hiding it at the office because it is so awesome. Ha ha no, I’m just kidding. I don’t think they stole it. But still I haven’t gotten it. I did get some letters from Grandma. And, thank you Grandma, I do love your letters to me. They are the best, ha ha and the Happy Valentine’s Day one was great. I hope everyone is feeling well. Even Charlie, I hope he stops pulling out his tail feathers soon. CD Player? I can definitely go buy one. I’ve been thinking of investing in an Ipod Nano too. 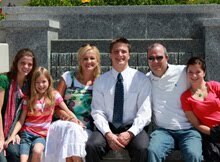 Elder Bailey’s family sent him one and they are pretty cool. I don’t know, what do you think? And if I do get one, do you think you guys could help fill it with good Tab Choir and church music? I am going to send a package with the memory cards intact very soon. Carnaval Alegria por la Vida (Happiness for Life Carnival) in Managua sounds pretty cool. But unless it passes by the Carretera Sur, I probably won´t see it. 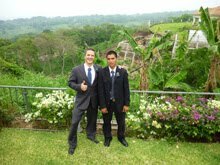 Thank you for sending me all the names of the Missionaries serving in our Ward. I think it is Awesome there are so many serving. 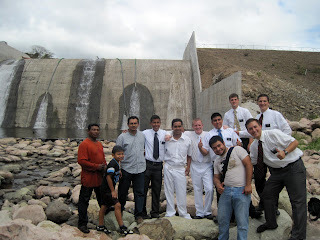 I would now like to give a shout out to all of them, (even though they should never look at the Blog until after their missions because the Missionaries from the Grandview 1st Ward and the Wilford Stake are Obediente con Exactidud. (Unless their Mission President says they can. And I think the couple missionaries probably can). To the 11 Missionaries currently serving from our Grandview 1st Ward: Les doy felicidades y mi amor a ustedes por su servicio a nuestro Señor y quiero lo mejor para mis compañeros en la obra mientras ayudamos los hijos de nuestro Padre Celestial venir más cerca de Cristo. Buena Suerte, Dios sea con Ustedes hasta nos vemos. (I give congratulations and my love to you for your service to our Lord and want the best for my colleagues in the work while helping the children of our Heavenly Father to come closer to Christ. Good luck, God be with you until we meet). Dad, I don´t know what this chanchada (hype) is about trading Deron Williams, but hopefully we can get some good draft picks then. Woopdy doo for BYU ha ha but that’s great that they have a chance at a number one seed. That’s so awesome Mom that you and the Activity Day Girls donated to Heifer International. I do hope someone in Nicaragua gets a flock of chicks because of it. Time will go by fast and before you know it I will be eating your Sunday Night Pot Roast and Mashed Potatoes and not rice and beans. Ha ha but until then I’m not complaining. ¨¡No pregunta, solo comelo!¨ (We do not ask, just eat it!) is my motto. Alexis, Congrats on the Study Abroad! That is exciting. Don’t succumb to the dark side. 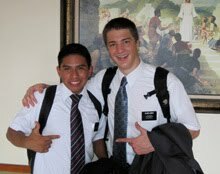 And if you don’t find your exaltacion in these ´lots of guys´ there are plenty of dorky missionaries here that want your email address. Emily, that’s great that you have been dancing. And guess what, I may be a little scared that you are getting your license, but it’s ok. Because the people driving in Managua are Crazy!!! They must give out licenses like gift cards or something. Ha ha no, just kidding but they are super aggressive. And I don’t think I have seen a car yet that doesn’t have at least a few scrapes on its sides. Ha ha good luck, I love you, drive safe. Hannah! ¡Felicidades! (Congratulations!) That is sooo tuanis (cool) that you won a trophy at the District Science Fair. Second Place is a big deal in a competition like that. I am so proud of you and I know there are more big things to come, right? Guess what, things are about to change up a little bit... I have CHANGES!!! I am actually pretty disappointed to leave Boaco. I wish I could have finished things up here, the Branch has the potential and I think we are almost over the hill. I also wanted to be able to see the familia of Teresa and Jorge be baptized and confirmed before I left. 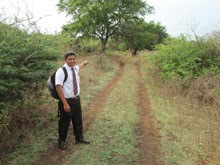 But Elder Leiva will have to continue helping them out now. I think he will probably train a new gringo too. But I am also quite excited to go to a new area and have new opportunities a encontrar, ensenar, bautizar y retener Familias!!! 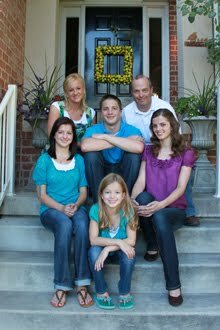 (to find, teach, baptize and retain families!!!) I can't wait. Ha ha that’s great it snowed. Yeah, we are in summer here. But today in Boaco it has been overcast, even a little rain drizzled when we found out I had changes. I am sorry to hear about Alex's Grandpa. That is too bad. Salud (Send well wishes to) his family and if they can, ask them to send a message from me to Alex que le amo y le extraño. (I love him and miss him). I will be praying for him and his family. I can't wait for Wednesday to pick up the package!!! I'm not sure what the secret spy hidden device with rewind button in the Pringles could be... BUT, Now I know that I got Pringles! Ha ha. I will ask the office Elders on Wednesday if there is anything they can do about my hostage package. Restaurants in Boaco: One time I ate at this pizza restaurant for Thanksgiving with Elder Coj. But the restaurant’s pizza was the standard pizza. That’s about it besides the street vendor food. Which is always really good when you buy the right stuff but it usually leaves your stomach that night ha ha. A tradition I started for the District of Boaco is every time we go to Juigalpa on the trip back at the Parada de Buses (Bus Stop) we all buy Quesillo. Haha it is their cheese, wrapped in a tortilla, covered with this cabbage carrot mix thingy and this really good pica sauce and dipped in the Quesilllo creme. Then she sticks it in a bag, you tie it up and bite one of the corners and eat it out of the bag. It’s sooo good and I always go to the same lady because she makes it better than everyone else and gives us a little extra creme because now the missionaries always come to her. Oh and I have another great food story to tell. Ha ha that actually happened earlier today. 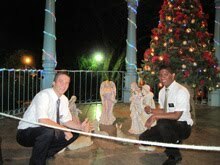 So last week, Elder Bailey, Beto and I went out to visit for Mormon Battalion. As we were talking to a part member family somehow the topic of Pupusas came up (we were with a Salvadoran) and Beto said something about food competitions eating pupusas and how they would eat more than 20 pupusas in an hour. And I was like, "Yeah I can eat 20 pupusas in an hour." Ha ha needless to say, the topic never rested until a little after 3:30 pm today. 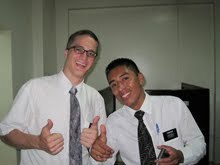 Ha ha so Elder Bailey told me that night if I could eat 20 Pupusas in less than an hour he would pay for it. ($10 American, C$200 in total). So I took him on today. The only rules were, 20 pupusas, an hour or less, if I vomit it’s over. What was better is that the whole Zone came to Boaco today for PDay. Ha ha the first ten minutes were great. I downed 6 pupusas. Beto says he is done after 5. The first 6 were carne pupusas, then the Doña brought out the frijole (beans) pupusas and I was starting to slow down. I finished my tenth casi (almost) exactly at the half way mark. And boy, the next 4 were super tuff, harder than Thanksgiving, or even harder than the One Pound Challenge. I almost lost my pupusas several times, it was too hard to chew and swallow normal so I decided to switch to the pill popper technique were I would stick a piece in my mouth, sip a bit of water and just swallow it. But I had already lost a lot of time. I started my 15th with about 15 minutes to go. But there has never been a harder pupusa to eat. Everyone was all cheering and everything. 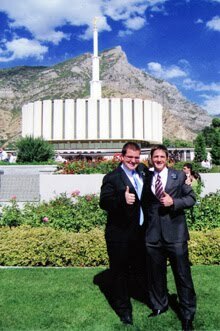 It was great (Even Elder Bailey wanted to see me hold it all in). So he took the plastic bag out of my hands and said I can’t puke, right as I stuck the last piece of the 15th pupusa in my mouth. Ha ha as I swallowed, I went from 15 pupusas... to 0. Ha ha ha. I’ll save the details from the email, but needless to say, I lost. But it was fun, and now we are going to start the 20 Pupusas in an Hour Competition at Beto’s restaurant. We are going to put my picture up and everything as the current record holder at 15 pupusas in 58 minutes. Beto says for the reward of anyone that can beat it, he will give them a pupusa. Hahaha. We went to the cool water fall with the whole Zone today. 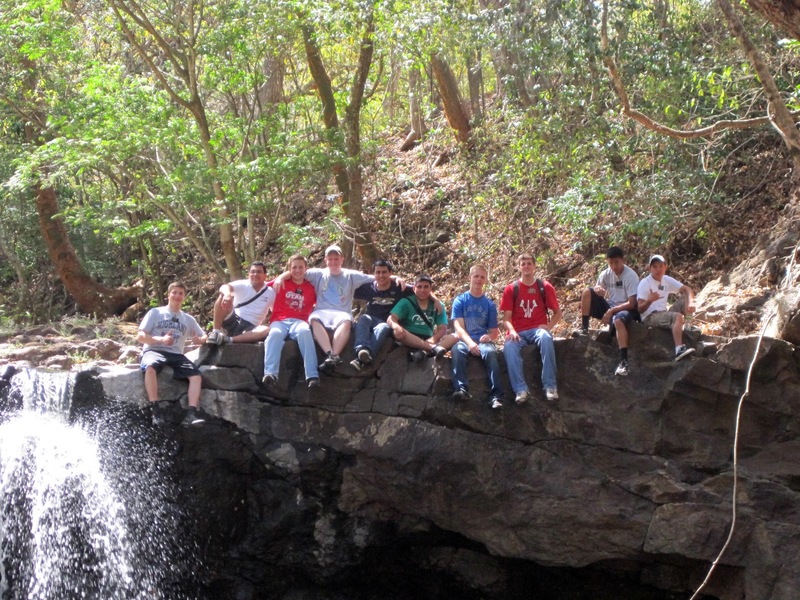 That was fun, but we couldn’t find the howler monkeys. I must have scared them away with my howling. This Sunday, we had District Conference. Our bus from Boaco was packed and the Family of Teresa and Jorge came. Hannah, I will take pictures of Nicaraguan money and send them to you next time. Thanks for the updates. I will talk to you all next week in my New Area. I don’t have any more time left. ¡Feliz Dia de San Valentines! Happy Valentine’s Day! Thanks for the emails everybody! Things are going good here. We are in Juigalpa today because we had a Zone PDay. We had a conference meeting first where we all taught principles from Predicad Mi Evangelio (Preach My Gospel). Then we had a big water balloon fight and played fútbol. 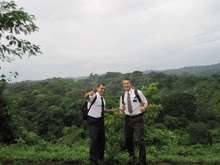 I have pictures to send but the other missionaries don’t have the right cable for my camera. I will send them next week. The weather has been good but right now it is raining. In Boaco, it has either been really hot, or raining. People have told me it’s a little extraño (strange) that it has been raining so much because it is supposed to be summer. I am afraid the Mission Offices were not able to help with the package Aunt Jenny sent. I’m not sure if anyone can but the sender. I don’t have any problems getting up in the mornings, no way. But maybe every once in a while I have forgotten to make my bed. 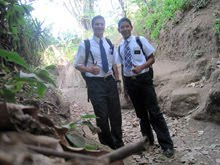 But the good news is Elder Leiva is a very organized neat person so I am learning from him and I am doing much better making my bed in the morning. This Sunday was one of the first Sundays in a while that a complete family of investigators came. I was so happy. The Mom is a super positive investigator and already has a very strong testimony. She told us she wanted to be baptized this Saturday but unfortunately she and the Dad aren’t married yet. The kids are super awesome too, they have a 14 yr. old an 8 yr old and a 4 yr. old. 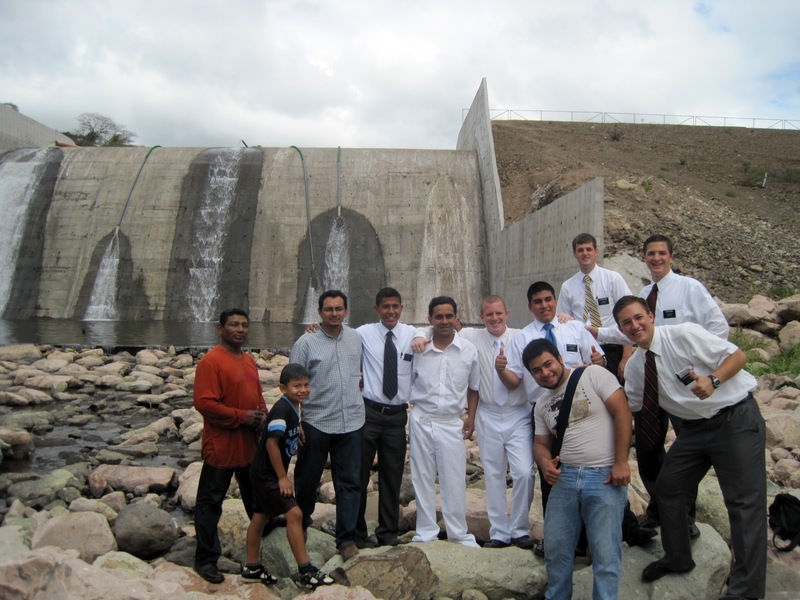 They love the missionaries. I was actually a little preocupado because they weren’t there when the meeting started. But when she and the kids walked in I had the biggest grin on my face and I went and sat by the kids. So having them there was great and spiritual in the first place. 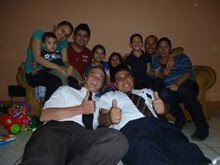 But then later, the Dad even showed up and we had a class with all the investigators and missionaries. We had a spiritual meeting about el Espíritu Santo (Holy Spirit) and later in Priesthood meeting about Sacrificio (Sacrifice). He came up after church and told us that in the beginning he came for the wrong reasons. But by the end he had completely changed and really enjoyed Church. We will see how things go with him as we continue to teach the Family. 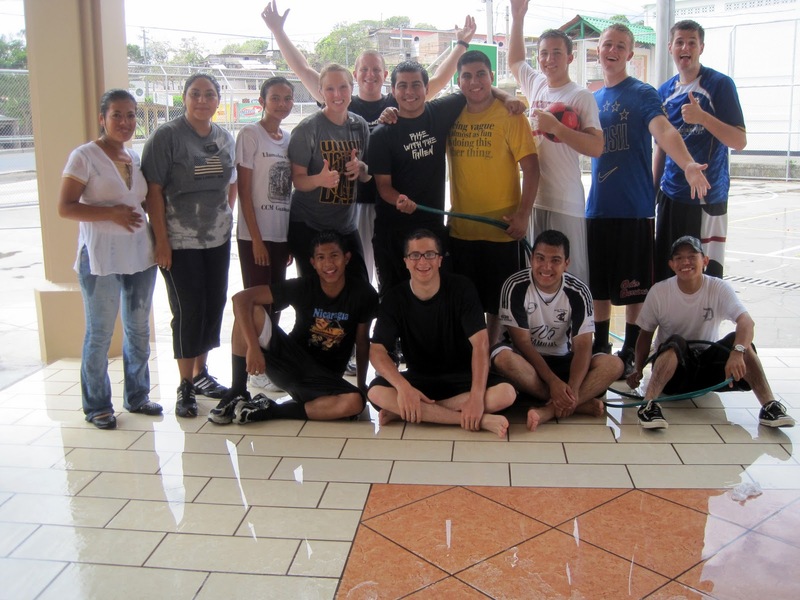 Hey that is great we have 11 missionaries from the Ward! But who are all of them!?!? Do I know all of them? Hey thanks for the journal entries Dad. Have a good week I love you. And I am glad you and mom had a nice Valentine’s Day date. Good luck with school, Alexis. Do good on your test. Hey no Valentine’s, Emily. But thank you for your Valentine’s Card. Te amo también (I love you too). Good work with the DC. I hope you are having tons of fun. I am proud of you. But hey Hannah, congratulations on the Science Fair Project!!! I’m so proud of you. Just like your big brother. Except mine was about air pollution and inversion. Ha ha not quite as tasty as lollypops. Smart topic. But I would like to know the results of your experiments and of the District competition. Hey, make a cool Valentine box that shoots your Valentines at them. I love you too! This change has gone by even faster than the others. Imagine on the 18th I will have 6 months. That is a fourth of my mission!!! That is way too fast. How are things in the 801? Has the time gone by fast there too? We came to Managua today to finally get my Cedula (ID card). Ha ha I don’t know if I have been illegal in Nicaragua for a while but now I have my ID card and I’m good to go. We also ate McDonalds which was a nice treat and we came to the office to pick up some stuff from the distribution center and to write. But I don´t think there is anything the mission will do, is it just asking that we pay the tax or is the package confiscated? I hope not. Tell Jenny and her family thanks ha ha it’s the thought and not the Nicaraguan postal service that counts. So like I said we are at the offices and we are writing on the computers in the Church´s Employee Search Service program (I forgot what it is called) and I am not going to have the time I should because I think we are leaving at 4 and I am only going to have a 1/2 hr. to write. 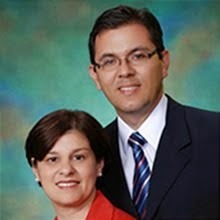 This week was a lesson with the family of Jorge and Sandra Conzales. I think I have already talked about them before but we went to a leccion (lesson) with them on Saturday with member Hermano Jorge. It was a great lesson. They have 4 kids, 3 daughters who are a little older but not daughters of Jorge and a little boy. They still aren’t married but know that they need to be and are going to work on it. They have had some problems with the family but in the leccion we talked about how the Gospel with bless and strengthen their family. And how with the help of the Atonement they can change the problems and differences in their lives and bring their family closer together. It was very spiritual and the Dad said that he couldn’t go to church this Sunday but pretty much gave us an oath that he and his family would be in church next Sunday. We committed the whole family to baptism on the 26th of Febrero (February). I really have faith that this family can make it. One day even to the temple. One night last week we were heading to our house from a lesson with the family of Hermana Elba. It was late (but not too late because we were teaching a lesson) and we were walking past a row of houses with their doors open (I love that they leave their doors open because I can look to see if there is a family in the house (not creepy, because I’m a missionary). 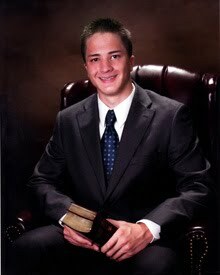 We had just passed an open door, When Elder Leiva suddenly stopped dead in his tracks. We both knew what that meant and walked up to the door where we found an Hermana watching TV. Turns out she is an ancient investigator, and has already been to church a bunch. We got to know her a little better and why she wasn’t baptized. Long story short, the next cita (appointment) she asked if she could be baptized. We have been praying hard to find people that could be ready to be baptized, and our prayers were answered. Last week I was in Juigalpa on splits for 3 days. We got a call yesterday after church and left last night at like 5:00 to go to Juigalpa so we could wake up at 4:00 to come here to Managua to the Immigration Center. We are probably going to get back to Juigalpa around 8 or 9 so we won’t be able to do anything else. BUT I got to see all my buds from my room in the MTC so my Pday was Pretty Great in the end. Plus I’m legal now! Ha ha I am doing great. Ok, but I just remembered something. So Elder Bailey’s family sent him the scripture stickers for every lesson in Preach my Gospel. They seemed pretty sweet because they are coded with all the lessons and stuff. 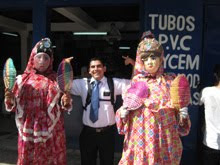 But I’m not sure if they are really Awesome or dorky and not good for a nice set of missionary scriptures. Which reminds me, I still have not used my really nice scriptures because I am going to need nice individual cases for each of them first. I am using the ones from the MTC right now and they are getting pretty beat up. Dad: Congrats on BYU, that’s a shame the U is struggling. Ha ha they were watching the Super Bowl on every TV here in Nicaragua last night. Love you Dad. Mom: Valentines! Ha ha they have decorations up here in the big mall in Managua. But they still have the snowflake lights and Christmas decorations too? Ha ha. That is awesome to hear of a package. There is always much anticipation. The mission is great. I can’t wait to get the Primary letters and pictures. I am slacking on the photos. I don’t even have my camera right now. (But I have 2 4gb SD cards full of them and I need to send them home with some other stuff!!! I don’t think I have a free Pday next week either! I love you so much. Alexis: Congrats on the study abroad!!! That sounds so fun, and Falicidades (congratulations) on your Promotion. That is awesome. So you are the boss now entonces (then) you can tell them that you are taking 5 weeks off for study abroad. Love you. Emily: Ha ha oh no not SYTYCD again!!! You should try out! The one British dude practically already knows you! That is pretty cool you got to go. Love you. Hannah: Huh? Dun dun dunnnn!!! Well, I am not mad at you. And I think that is very good that you are taking responsibility for your grades and understand their importance. That’s an A in my book. I am doing good. How about you? Yes I am very happy, and very happy to be writing you. Are you happy? I hope you are! And I am sleeping well, even on the floor in someone else’s house. I must just be really tired. Good luck with your science project Hannah! And good luck with your crush. P.S. I LOVE YOU TOO!!! 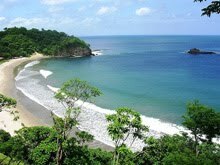 ~ Nicaragua is in Central America between Honduras and Costa Rica. ~ Nicaragua is a small country. Geographically, it is slightly smaller than New York State. Population: Less than 6 million. ~ It is the second poorest country in the Western Hemisphere (Haiti #1). 48% of the population lives below poverty level. ~ Average Annual Income: $1,071. ~ Official Language: Spanish. Religious Majority: Roman Catholic. ~ President: Jose Daniel Ortega. ~ Monetary Unit: Gold Cordoba Oro. $1 USD = C$ 22.4 NIO. ~ Main Exports: Coffee, shrimp, lobster, cotton, tobacco, beef, sugar, bananas, peanuts, & gold. Nicaragua Managua South Mission accepts Pouch Mail which means postcards and letters that are single sheet, folded into three-panels, and taped at the top only (no envelopes) sent to the above address. 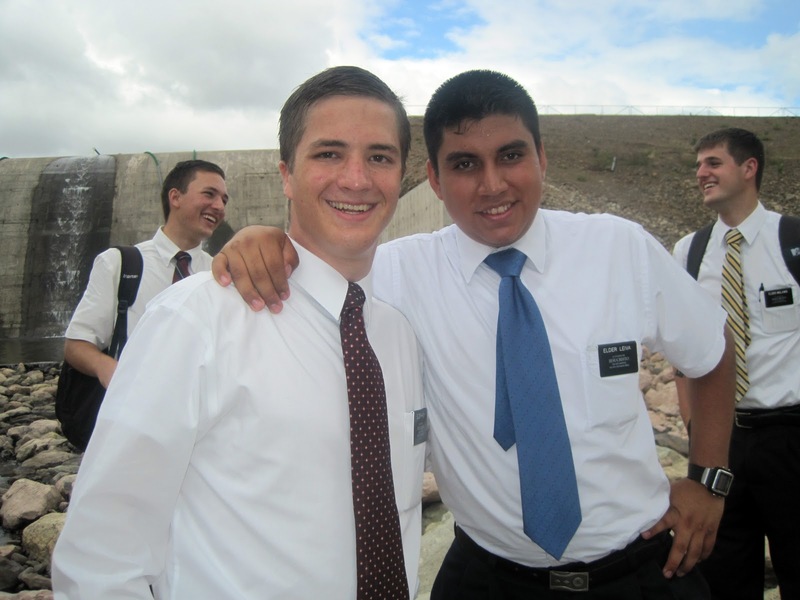 Send Packages & Letters to Elder Hardy at the above address.